Spanish pshysicist and ice cream expert Manual Linares invented an ice cream Xamaléon, ice cream that changes color when you lick it. How cool is that?! The reason why it changes color is just chemistry: “Any food can change color depending on temperature and oxidation”. The ice cream is baby blue before serving. Then they add a spray which turns it dark purple in about 10 to 15 seconds. 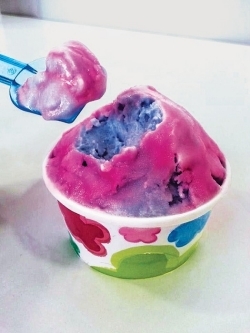 Then when you lick it, it will change into pink colors.